Professor Johanna Mendelson Forman created and teaches one of the most popular and sought-after courses offered at the School of International Service (SIS). It focuses on conflict and diplomacy, post-conflict rebuilding, soft power, diaspora, and more, but it has one element that no other course offers: delicious food. An expert on post-conflict transition and a Distinguished Fellow at the Stimson Center, a nonpartisan policy research center in DC, Mendelson Forman’s idea for the class was sparked in 2013 when she attended a State Department lecture on culinary diplomacy. She began scribbling notes for the course and envisioned it as a way to demonstrate how food can be used as a survival and security tool in conflict zones and as a post-conflict reconstruction tool. For many migrants and refugees, cuisine becomes a way to earn a livelihood and retain culture as they resettle. While students in Conflict Cuisine get to enjoy unique foods and traditions offered by diaspora restauranteurs, they also gain new perspectives on international relations, soft power, migration, conflict, and more. “Students who study international relations—especially at the School of International Service—want to know all the tools in their toolkit that they can use to persuade people and countries to build peace, promote sustainable livelihoods, and resolve conflict rather than use force,” asserts Mendelson Forman. 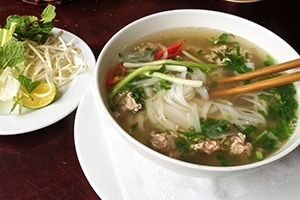 In the upcoming Conflict Cuisine course, Mendelson Forman’s class will go to Das, an Ethiopian restaurant in Georgetown; Minh’s, a Vietnamese restaurant in Arlington owned by the caterer to Vietnamese embassy; the Culinary Arts Center at the Carlos Rosario School; and Union Kitchen—which features many diaspora chefs—for a Laotian and Syrian meal. Since Conflict Cuisine was established four years ago, the culinary diplomacy field has grown rapidly. Mendelson Forman attributes this to the booming number of worldwide refugees, the increased “foodie” culture of millennials, and the growing emphasis on sustainable food and agriculture in public discourse. Currently Mendelson Forman is working on a book that will add to scholarship in the field. Peace, One Plate at a Time looks at amateur chefs in refugee camps and war zones who use food to create normalcy in their environments, and at celebrity chefs, such as Jose Andres and Massimo Bottura, who are using food to help better societies. With the holiday season fast approaching—a time notorious for feasts and table-gatherings—Mendelson Forman is a proponent of using meals as an opportunity to share ideas and demonstrate diplomacy. “Food is a way to engage on international relations without have to be around politicians. You don’t fight over a meal,” she says.